Rob Beckett hosts the grand final as the ten finalists compete to be crowned champion, with the winner taking home a Â£50,000 prize. Browse content similar to The Final. Check below for episodes and series from the same categories and more! Six weeks ago, a new competition began. I'm a mum of three. This is the first time we've performed for a live audience, ever. getting TV's toughest crowd to join in. ..headed up by a global pop icon, Geri. Oh, my gosh, it's intense! and walk away with the £50,000 prize. So who will get the hundred joining in? You came out and you slayed it. I'm trying so hard not to cry cos I don't want to my eyelashes to fall off. Just wanted a bit more drama, you know? You sang like your life depended on it. I'm absolutely loving it, it's like the best concert I've ever been to. # Can you see it in my eyes? -# Can you feel it now? # Can you hold it in your arms? Cannot believe we're actually here! Everybody's upped their game, look at this. We've got James Bond. We've got Cinderella. The 100 are taking their role more seriously than ever. -50 grand at stake here. -We might be a little more critical. They need to grab me the first time they come out. -It's got to be a masterclass in performance. but they don't know who will be singing what. Can you imagine how nervous they are? -Come on, let's have a good show. our huge range of singers all over again. but can they do it when it matters most? What they've done before doesn't matter. first up it's musical theatre performer Jodie. It feels amazing to be in the final. given another shot to sing. In her heat, Jodie was the last act to perform. "I could get above that." But she wiped out the competition with one of the highest scores in the series. because this is obviously their favourites against each other now. -It's really put it into perspective now. of someone getting 50 grand! Do you know what I mean? My song choice tonight is a really well known song. I feel like you have to get up on your feet for it. My heart will probably be pounding through my chest. I'll be sweaty. I just hope that I can do it justice. Here comes the first finalist, Jodie. and I hope you like my song this time round. Now, The 100 can't join in until the lights change. It's going to be a good first song. Now, go for it, in the bridge. Can she get a few more up? She got 97 last time. They're being harsh, I think. Jodie, you got 83, well done! -Was it different second time round? Tina T, here, Tina T.
Are you a Tina Turner fan? I didn't know you was in the Power Rangers! I didn't know they had Sparkle Ranger! Did you enjoy Jodie's performance? As a gospel choir director, I look for vocals like yours. And can I just say, Jodie, your vocals were on fleek! Brilliant, thank you, Mr Fab. -Geri, you didn't stand up for Jodie. -I know, Jodie, I'm so sorry. We're looking for more than just a great singer. all of our hearts, and connect with yours. I want to forget everything and go, "Yeah, I'm with you!" -If you get the chance to come out again, let go. But well done. You scored 83. Take your seat in the top three! Because it's the final tonight, things are slightly different. will all sing again in the sing-off. will take home the £50,000 prize. Let's bring on our next finalist. Wow, what a way to open a show. -but there is a lot of talent coming. Hello! It's the final, whoo! Billy busy-legs over there, he's giving it some. ..knocking out a score in the 80s in his first performance. And then again in the sing-off. Performing in the final is obviously a lot of pressure. To win 50 grand would be incredible. He's got that presence walking around that stage. -He's probably the best entertainer. -Yeah, he's a good frontman. Good luck, Karl. 83 to beat. Thought I would have got used to that noise by now. up on their feet and singing along. Are The 100 being a bit more critical this week? Thank you very much to everyone that pressed and stood up, thank you. Geri, what did you think? Karl, I'm gutted for you. but I think you could do that better. Can I do it again now? I know, I feel you've got more in you. Ash, you perform in a One Direction tribute act, is that right? -Who are you in that? -I've been them all but Zayn. and you've added a key change, and you smashed it. -I loved it, well done, mate. Quite laddy down here, isn't it? All five of you look like you're on trial for fraud! Nice one, Karl, you scored 33. Take your seat! -Oh, he's gorgeous, isn't he? It's sad. -I want to take him home. You've got this, you've got this. You can do this. Rachel's next. The Welsh girl. To think that I'm sat here and I'm in the final is just..
it's just that lush little feeling. I think they can hear that back in Wales! ..brought her a big score. And when it came to the sing-off, the score got even bigger. I think The 100 are going to be expecting massive performances. Geri's not stood up yet. -She's being harsher tonight, like, really harsh. What I've got to do now is try and up my game. but will she go straight to the top tonight? She's a powerhouse. She's got those money notes. I can't wait to just see 100 people on their feet. Well done, Rachel, you scored 46! That puts you in second spot. How do you think that went? Did you enjoy it? I love the song so I just sang it as good as I can. Well done. Lili! You look incredible, Lili. -Look at her! You look amazing. I love this song, I sing it to my husband every single night. -Does he get much sleep? He's getting fed up with it. I'll tell you something, Rachel. it came to me. You are brilliant. That's a beautiful comment, thank you. Um, Geri, you stood up. I did. Do I think it was your better performance? No. and I was like, "Yeah, OK, I can feel that." Well done. you've taken the second spot in our top three. Go and take your seat, well done! So, all three seats are full. Karl, you are now the act in danger. will be singing one more time for that £50,000 prize. -Much harder than last time, innit? No sweets going round? No sweets? Look under Geri's seat, we may have, we threw some Haribos there. -There are some as well. as seven more finalists sing for a place in the top three. Will Michael and James score another maximum? Will the Sundaes get the party started? Or will big-haired Rachel be a cut above the rest? She's really got to pull it out of the bag now. when I get off this seat. Just in case Jodie gets knocked off, she's a gin girl, I think. if Cheshire mum Chloe has anything to do with it. My last heat was like nothing I've ever experienced. I felt like I did on my wedding morning, like, I couldn't relax. with the show tunes classic Don't Rain On My Parade. Being tough today, we're being tough. -I mean, even 83's not safe, is it? There's some big voices to compete with this time. put my heart and soul into it and it would just be amazing to win. Here comes our next finalist, Chloe. She's got just 33 to beat to get herself into the top three. on he West End one day, so, I'm going to give it a go for you guys. The song's too big for her. It's tough, man, these guys are being tough tonight. Well done, Chloe, you got 27! Unfortunately, not enough for the top three. They're being harsh tonight, The 100. It's the final so the standards are so high. but I enjoyed every minute, and I just really enjoyed it. Paul, you perform on he West End. You know a lot about the old Les Miserables. You didn't stand up for Chloe's performance. between loving it and not to sure. and it got a little bit shouty. You know, I didn't stand, but you should be proud of yourself. We'll shuffle down there to Corene. -What did you think of Chloe? So at first I wasn't going to stand up. I felt like you were singing to me. I just felt you were meserising me, so I just had to stand up. And a new word there, you was meserising! to get into the top three, but you've been an incredible performer. a lot of fans here, give it up for Chloe, everyone! So that means, Karl, you're still in the danger seat. you'll be leaving the competition. And let's see what happens when we bring out our next finalist, James! -George, did you stand for that girl? -Yes. I have for everybody so far. It's like the best concert I've ever been to! -Yeah, he's got a lovely soul voice. This is it now. It's the final... It's the final! in my 21 years of living. ..student James was one of only two acts to score a maximum. because there's such a high expectation. I've got a feeling he's going to get 100 again. -Yeah, he's one of my favourites. Since the heats, I've been trying to plan out this song for the finale. They've seen me do the ballad, I think now it's time they see something new. There's literally no room for mistake. -Here he is. My man. Let's just hope this isn't a one-trick pony, this, now. Can he score 33 and knock Karl out of the competition? Hey, everyone. Win or no win, let's have some fun tonight. Oh, I'm so nervous for him! # Does that make me crazy? This is the quickest we've seen people get up so far. Can he pip Jodie to the top spot? -He took us on a vocal journey. Well done, James, you scored a huge 87, which puts you in the top spot! Paulus, you stood up in the heats, but not this time. You are a wonderful singer. I didn't feel that you were telling the story, the right story. I want it to match the lyrics of the song, the character that we're given. Fair enough. Maryam, you stood up, you'll sing along, Maryam. Yes, I did. James, you know, absolutely told the story. -Did it make your hair stand up, yeah? -Oh, on the arms, on your arms. because the idea that you weren't telling a story is rubbish. and I hope you're in that top three, man. ..leaves the competition. Have you enjoyed yourself? so hopefully we're all going to keep in touch. Especially James, if he wins the 50 grand. Give it up for Karl, everyone! James, go and take your position in the top three! So, Rachel, that means you're now in the danger seat. I'm worried, I'm worried about Rachel. I feel like she deserves to be in this competition. two beautiful women, I don't know what's going on! -We'll calm you down, darling. Luckily these buttons are undone, eh? I'd put my life on the fact you'll be in the final three. It could be anybody, it literally could be anybody's game. it's just the most exciting thing that's ever happened to us. the Sundaes scooped a massive score. It was like Spice Girls' happy cousins. And then absolutely smashed it in the sing-off. The competition now is the best of the best. We would love to win it. One of the best things is knowing I'm walking out there with my two best friends. I don't know if I'm all woman or all sleeve. -that's not a good look. -It's too late for that! They scored 88 last time. and knock Rachel out of the competition. They could have dressed for the occasion. with a generous topping of sass. -Oh, my gosh, the yellow, the yellow, I love the yellow. I don't think it's meant to be a chicken. They're going up quick! Geri's up. It's like three Lady Gagas! Well done, The Sundaes, you scored 75! We feel brilliant, we love doing that song. It's one of our favourite songs to sing of all time. And this is just the cherry on the top. people think, on one hand, it's easier cos you've got backup. But you've also got to make sure you're really on point and in sync. You guys are utterly joyful. which means, sadly, Rachel, you'll be leaving us. going to have a raspberry, you're going to have a mint choc chip as well. Give it up for Rachel, everyone! Sundaes, take your place in the top three! for the £50,000, so good luck. -And over the past six weeks, we've had it all. -Did you have any idea what was going on? -Two? Two?! What's wrong with you all? Cheers, Geri! All your CDs are going straight in the bin! ..and whatever you'd call this. You do know they do adult-sized shirts? You're like the baddie in a Disney film. You've stood up for everyone so far. I know, I understand the premises of the game. I've never felt so alive! I love this show. High-five, buddy. getting a place in the top three is now tougher than ever. we might lose The Sundaes and they are my favourite. My heat was an amazing experience. because I think that would have put me off singing. and a flood of tears. There couldn't have been a moment that I felt prouder in my life. Being in the final has a higher level of pressure. The stakes are higher and it will be ten times harder than before. This is going to be her moment, I've got a feeling. Bye, guys, see you soon. I feel a little scared of going to face The 100, but I'm ready. Oh, here she comes. She looks gorgeous. Beautiful, she sings like an angel. The Sundaes are looking worried. I feel so privileged to be in the final. The song I'm going to sing is from the first musical I ever watched. Can Victoria score more than 75 and get in the top three? How does she make it sound so easy? Yes, they are very, very, very high scores. That's second placed in our top three, well done. Oh, Hunny B, you are in tears. Are you all right? I'm trying so hard not cry because I don't want my eyelashes to fall off. But, Victoria, you are just absolutely effortless. Your voice is so beautiful, thank you so much. Victoria, you have such a beautiful voice. When you hit the stage, it's like you're this angel. I think you are the one to watch. I think you've got a very, very good chance, so well done. ..we lose you from the competition. we really have, and everybody has been fantastic. Give it up for The Sundaes, everyone! Victoria, congratulations. Take your seat in the top three. you will be in the sing-off against each other for £50,000. and, Jodie, you are now the act in danger. We've got three more to go. -In theory, all three of those people could leave the podium. -None of them are safe, none of them are safe. Guys, it's been a pleasure! This is a really big deal for me. Singing is in my blood. In her heat, Tabi left the office job behind to score a stunning 96. The song that I've picked for this final is another party-starter. 83 to beat, it's a big score. Let's see if Tabi can do it. I really believe that I could win this. # I cannot hide it! Well done, Tabi. You scored 65.
but that was a great performance. Did you enjoy it? I loved it. Thank you so much, everybody, thank you. Mr Fabulous, you didn't stand up. No, darling, but you've got a beautiful voice. I just wanted a bit more conviction. I wanted more drama, you know. -I'm very shy, can't you tell? for the top three, but you've given some amazing performances. Give it up for Tabi, everyone! you are definitely going to be in the sing-off for £50,000. -How are you feeling, James? but I'm looking forward to it, I'm looking forward to it. -And, Jodie, you are still the act in danger. Holding in there all right? Well, good luck to everyone. Let's bring out our next finalist, it's Michael! -I can't believe that it's just me and you now. I can't believe I'm back here, in the final, it's surreal. after getting every one of The 100 up and singing along. I never expected to get 100 people on their feet. You see your family from the side and everyone is just so happy. That's what people dream of. This time it's going to be so hard. We want to be excited. The song I've picked is a massive hit. I've just changed it up a tiny little bit. I think Jodie is in danger. This is really happening right now. All right, Michael? Come on. Oh, my God! Here he comes! Michael scored 100 in the heats. Can he do it again and knock Jodie out of the competition? Hi, everyone. I'm so grateful to be here today. and I just really hope you enjoy what I've done. Let's see what he's going to do. You know, I don't think he realises how good he is. I'm up here! Here he is! and you are straight into the sing-off for 50 grand! That's just overwhelming, I can't believe it. Thanks a lot! Georg, you was a big fan of Michael in the heat. You started so high in your range, I thought he's got nowhere to go. -I take my hat off to you, it was amazing. That's from James Bond as well, those comments. Not everyone loved it, though. Divina? I know, they've turned already, haven't they? to where I was expecting to go with the last time that you performed. even though I didn't know this version of the track. Those gloves! Like a Bond villain! Georg, sort her out, will you? Lili. You've not got up that many times tonight. What is it that got you up on your feet? This is a great anecdote, carry on. "but I could recognise it instantly." And, you know what? You sang like your life depended on it. which means, sadly, Jodie, you will be leaving us. and I'm just really grateful to have been here. Michael, take your place in the top three. Michael, you will be in the sing-off with James. You are one song away from winning 50 grand. Which means, Victoria, you are now the act in danger. -Bless you. Well, good luck. Right, now it's time for the last act of the night. Oh, my lord, it's anyone's game! So it's just depending on Rachael. I think she is going to smash it. When I sang in the heats, it was a thrilling experience. scored just enough to scrape through to the sing-off. to equal the second-highest score of the series. The song I'm going to sing for the final, I feel it's good choice. and there's some nice big notes that I want to get my teeth around. Do you know what? Rachael was one of my favourites. She is a good one. Rachael, we are ready for you. Do you want to come round? I'm going to go out there and I am going to smash it! -Oh, she's quite nervous, though. they can all fly up towards the end. You've got to love her voice. Well done, Rachael. You scored 73. Unfortunately, not enough for the top three, but what a performance! -Oh, well, it was great. And someone who loved it was Geri. You were singing along, what did you think? we always know that with you. -But you should feel very proud. And, Paulus, biggest surprise of the night. It's the first person you've stood up for in the final. and then I was standing up. -well done, that is a feat in itself. Give it up for Rachael, everyone! Guys, guys, the final three. We are the final three. Now we've got ourselves a final, ladies and gentlemen! I think I've considered the possibility of winning. but my family and my friends. I want to do it to show everyone that I can do this. and it's the one thing that has driven me to work as hard as I do. That's not pocket money, that's money! because I know my mum has been saving for a long time. Save half of it and then I'd buy a car. Oh, mate! Buy a better car than a Vauxhall Corsa! It wouldn't be bad, winning 50 grand. The odd handbag, you know. The final sing-off for £50,000. Each of you will perform again with a new song of your choice. so it's a level playing field. so your decision has never been more crucial. OK, boys, take your seats in the top three. Victoria, as you are in third place, you will perform first. That last note was her best note. Yes, but you can't just sing well on high notes. That's not enough for our Victoria. I'm sorry, that really moved me again. Well done, Victoria, that's a very solid score, 43. Happy and...everything all put together. It's not over yet, Victoria. James, you've got 43 to beat to stay in the competition. It is a lot, but she still could, even with that, you never know. I'm so excited, he's going to smash it. Now, THIS is the performance. Just relax and sing for yourself. and you are one step closer to winning £50,000. Sadly, Victoria, that means you will be leaving us. I have had an amazing time on the show. Give it up for Victoria, everyone. Michael, it all comes down to this last performance. You need to score more than 84 to take home the £50,000 prize. Come on, big guy, bring it, honey, bring it. # You don't really care for music, do you? Congratulations, Michael! You're our winner! James, well done on getting this far, it was a great performance. It's been awesome, man, I wouldn't change a thing. Give it up for James, everyone! that's what this show is about. You so deserve it. I'll have to peel him off you for a quick word. Michael, how are you feeling? I can't believe it and I'm just so thankful and I've had the best time! Please give it up for our winner, Michael! Well, that's it for this series. Thanks to all of tonight's finalists, The 100 and Geri. It's been an incredible night. Goodnight! 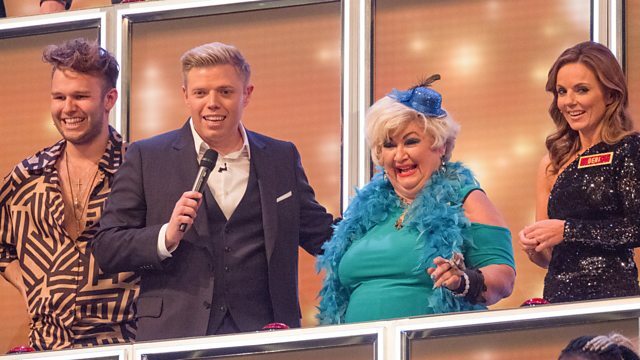 Rob Beckett hosts the grand final as the ten finalists compete to be crowned champion. Whoever wins the title also takes home a life-changing Â£50,000 prize. The finalists each perform a song hoping to get Spice Girl Geri Horner and as many members of the 100 up on their feet joining in. The three acts with the highest scores must then perform one final time in a make-or-break sing-off with a brand new song. Which of the ten finalists has what it takes to win over Geri, Paulus, Mr Fabulous, Lili, Divina and the rest of the 100, and in doing so win the series title and Â£50,000?